400 pages | 11 Color Illus. | 53 B/W Illus. Ever-increasing interest in oceanography and marine biology and their relevance to global environmental issues creates a demand for authoritative reviews summarising the results of recent research. 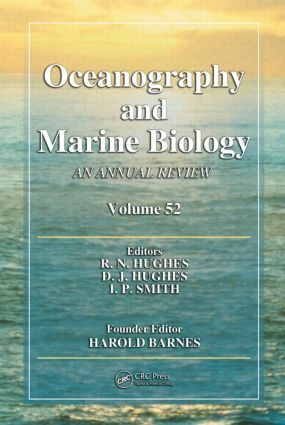 Oceanography and Marine Biology: An Annual Review has catered to this demand since its founding by the late Harold Barnes fifty years ago. Its objectives are to consider, annually, the basic areas of marine research, returning to them when appropriate in future volumes; to deal with subjects of special and topical importance; and to add new subjects as they arise. The favourable reception accorded to all the volumes shows that the series is fulfilling a very real need: reviews and sales have been gratifying. The fifty-second volume follows closely the objectives and style of the earlier volumes, continuing to regard the marine sciences—with all their various aspects—as a unity. Physical, chemical, and biological aspects of marine science are dealt with by experts actively engaged in these fields. The series is an essential reference text for researchers and students in all fields of marine science and related subjects, and it finds a place in libraries of not only marine stations and institutes, but also universities. It is consistently among the highest ranking impact factors for the marine biology category of the citation indices compiled by the Institute for Scientific Information.